The design I chose for my resume is unique and defines my bold personality. I designed a resume that an employer might stop to look at out of your ordinary pile of resumes. That is why I designed my resume slanted with the “I” in my name to stick out and to extend all the way to the bottom of the page. The “I” accentuates that “I” am courageous and that “I” like to take risks. This would definitely stand out to an employer in the broadcast field, particularly one in the entertainment field, which is where I intend on working. 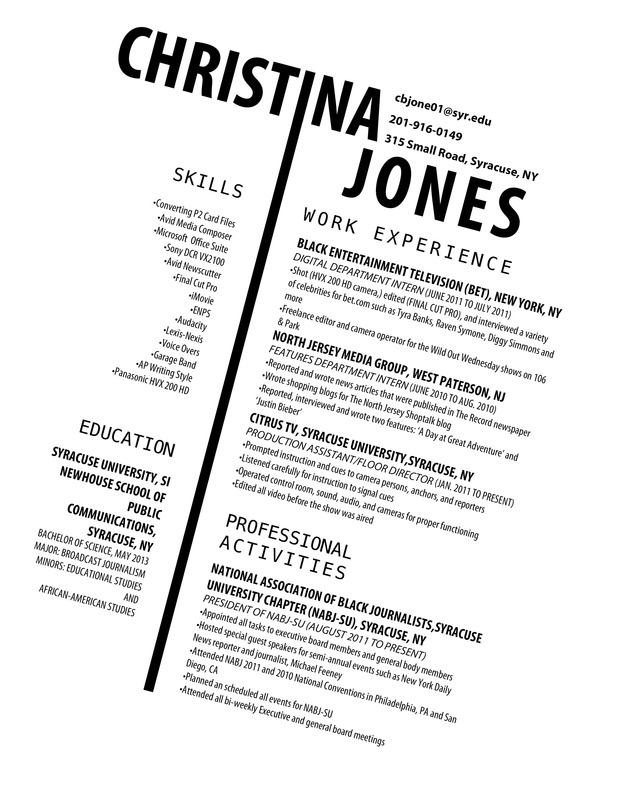 My only limitations were trying to fit everything on one page and making sure the resume didn’t look too overwhelming. Another limitation was trying to keep the resume as clean, clear, and concise as possible because it is already slanted which adds limits to it. I used Myriad Pro Bold Condensed for my word mark, Menlo Regular for the headers, and Myriad Pro again for the body text. The accentuation on the “I” is a slanted black line that is 9.85 pt.